Sometimes our guilty pleasures are, well, even more guilty and one of my all time favs has to be carrot cake. 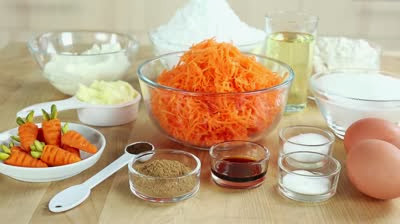 So, I thought I'd share this really simple recipe that’s guaranteed to have you coming back for more... well, when it has 'carrot' in its name it's pretty much part of your 5 five a day ;) And you certainly deserve it after baking up a sweat!!! And it’s the weekend, jeez how many more excuses do you need...!!? 2. Tip the sugar into a large mixing bowl, pour in the oil and add the eggs. Lightly mix with a wooden spoon. Stir in the grated carrots, raisins and orange rind. 3. Mix the flour, bicarbonate of soda and spices, then sift into the bowl. Lightly mix all the ingredients until the mixture is fairly soft and almost runny. 4. Pour the mixture in to the tin and bake for 40-45 minutes, until it feels firm and springy when you press it in the centre. Cool in the tin for 5 minutes, then turn it out, peel off the paper and cool on a wire rack. 5. Beat together the frosting ingredients in a small bowl until smooth, it wants to be about as runny as single cream. Set the cake on a serving plate and drizzle the icing back and forth in diagonal lines over the top, letting it drip down the sides. 6. And finally... enjoy!!!... And then find it a good hiding place for it!!! Sound easy enough for me to bake too! Look so yummy, can't wait to try baking it.